416 pp., 16 colour plates, 26 b/w illus. 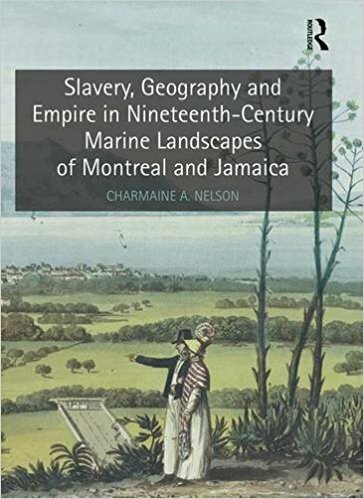 Slavery, Geography and Empire in Nineteenth-Century Marine Landscapes of Montreal and Jamaica is a deeply researched and complex book. As a comparative study of two island settlements that were part of the British Empire, Charmaine Nelson’s work draws links between Canadian slavery and tropical plantation slavery of the Caribbean through a focus on nineteenth-century marine landscapes produced in oil paintings, watercolours, engravings, lithographs, and aquatints. One of her principal framing questions asks what these landscapes of Jamaica and Montreal can tell us about empire, geography, and the economy of slave labour. She writes, “What does the colonial appropriation, use, and exploitation of land and its material transformation and representation as landscape have to teach us about the process of imperialism?” (2). Nelson argues for the displacement of the metropole-colony dichotomy that has dominated the field of slavery studies. Instead, she posits a new model based on the idea of colony-to-colony interconnections and pathways within the British Empire. Employing a postcolonial feminist reading, she intertwines art history, geography, and slavery studies in support of this colony-to-colony model and to propose “a second Middle Passage between the shores of the Caribbean and Canada” (7). Nelson reads geography as playing a central role in empire building and colonization. Her interpretation of Jamaican and Canadian (Montreal) landscape imagery is rooted in what she terms “the racialization of the land” (8), which, she argues is rooted in how “a geographical location comes to be identified by and through specific populations, natural and human-made sites and landmarks, forms of social, cultural, and commercial interaction and exchange” (8). These colonial landscapes, she argues, become cultural representations steeped in race and empire. Along with her use of the methods of postcolonial geography and art history, she is concerned with contesting the erasure of Blacks from Canadian history and from the study of Canadian slavery. She argues forcefully for Canada to be remembered as part of the African Diaspora. In support of this position, she deploys landscape art as a means to reevaluate Canada as a colonial power and its relationship to the Caribbean. She states explicitly, “this book then explores the selective erasure and emplacement of racialized subjects within the landscape of Montreal and Jamaica as they functioned to embed and police fragile and emergent alignments between landscape and belonging which shored up British imperial discourses of racialized possession and colonial entitlement” (11). The book contains an introduction and eight interlocking chapters. In chapter One, Nelson considers geography as a representational practice implicated in ways of knowing place. Chapters Two through Four look closely at slavery in Montreal and its relationship to the production of landscape art. Chapter Two provides an overview of slavery in Montreal under French and then British rule. Chapter Three investigates two images, François Malepart de Beaucourt’s Portrait of a Haitian Woman (1786) and George Heriot’s Minuets of the Canadians (1807), providing in-depth analyses of the representation of the enslaved African in Montreal. Chapter Four considers how the British used maps and landscapes of Montreal to impose an imperial vision on their newly acquired settlement. Chapters Five through Eight focus on the colonial landscape and depictions of slavery in Jamaica. Similar to Chapter Four, Chapter Five explores the “landscaping” of Jamaica in order to understand the British imperial imaging and imagining of the island. Chapters Six through Eight engage and interpret images from William Clark’s Ten Views in the Island of Antigua… (1823) and James Hakewill’s A Picturesque Tour of the Island of Jamaica… (1825) to understand the ways in which Jamaica and its production of sugar were visualized. Nelson argues that Hakewill erased black bodies and slave labour from the tropical landscapes in his illustrations, creating a sanitized, pro-slavery discourse. To counter this erasure, she examines the “material, social, and cultural realities of slave life in Jamaica that his images denied” (27). At the heart of Nelson’s book is a critique of the disciplines of slavery studies and art history. She argues that slavery studies has not engaged with visual art in meaningful ways outside the human body, and that art history has failed to raise significant and consistent questions related to race, colonialism, and imperialism because of the “unsuitability of [its] dominant methodologies and practices” (2) to such discourses. Because of the focus on the human body in slavery studies and the resistance of art history to tough discussions related to slavery, land, and empire, Nelson deliberately and methodically excavates the meaning of slavery in these two colonial locations through landscape art. Chapter Six exemplifies her project: she offers a close reading of Hakewill’s A Picturesque Tour of the Island of Jamaica… and his erasure of the enslaved body from the land. At the same time in this chapter, she writes poignantly about white male sexual exploitation of black women in Jamaica and the astoundingly brutal nature of Jamaican slavery. She does this in order to challenge Hakewill’s vision of Jamaican sugar plantations as scenes of “picturesque tranquility” (235). Her comparative project signals her position as scholarly activist and practitioner of a hybrid art history that incorporates a close attending to the visuals, a concern for what is seen and not seen, and a self-reflexivity concerning how the author positions herself. Throughout the book, one senses her outrage and indictment of the slavery complex as well as her commitment to telling a new story about the visualization and imaginings of slavery, geography, and empire in the nineteenth-century colonial world of Montreal and Jamaica. Renée Ater is a scholar of nineteenth- and twentieth-century art of the United States, whose research focuses on public monuments, race, space, and community engagement.